What does the warning message “lost 6.4 digits of accuracy” mean? 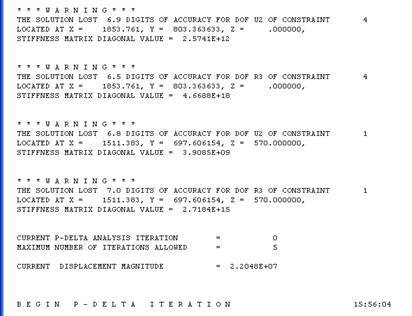 ETABS equation solutions are performed in double precision arithmetic, which allows for 15 significant figures. If you have global or local instability (e.g., a node that is not restrained), the solution will suffer a loss of accuracy. The program issues a warning if the loss is estimated to be above 6 digits, and will cease processing if the detected loss is above 11 digits. If you have an analysis where the number of digits lost is less than 8 for example, you should verify the results by checking where the errors are coming from, and also the *.OUT file to make sure the applied load and the reaction are in balance within 1% of each other. Loss messages can be a result of having very stiff elements together with very flexible elements. The rigid diaphragm assumption together with flexible elements is one example of this discrepancy. i would like to know one thing whenever i model a structure in Etabs some of the node which created wrongly is never deleted and errors are coming on that node what should i do in that case ….